It’s that time of year when we find displays of pine cones, gourds, and mini pumpkins at the grocery store, which happen to make the very best fall math and science center for my preschoolers! 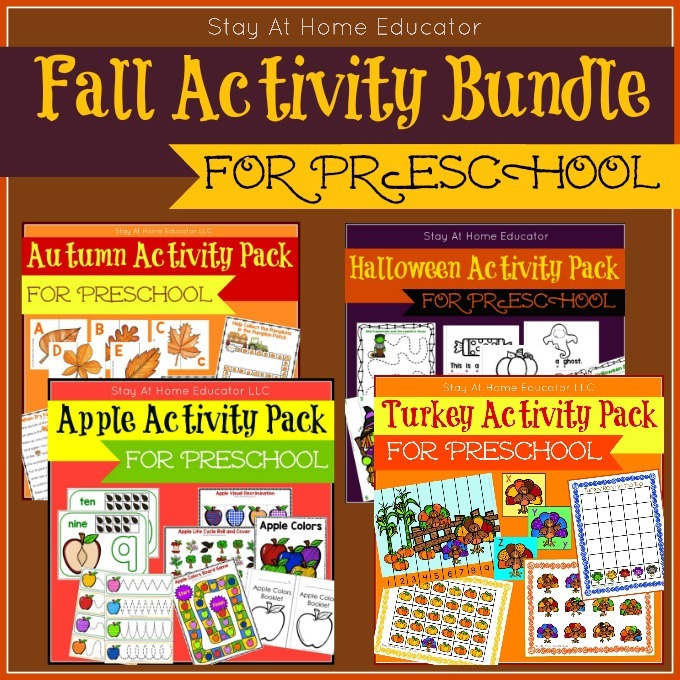 No fall preschool theme is complete without them! If I don’t find them at a local fruit stand, I’ll grab them up at the grocery store. Because no autumn theme in preschool is complete without mini pumpkins, gourds, pine cones, corn tassels, and even carving pumpkins! 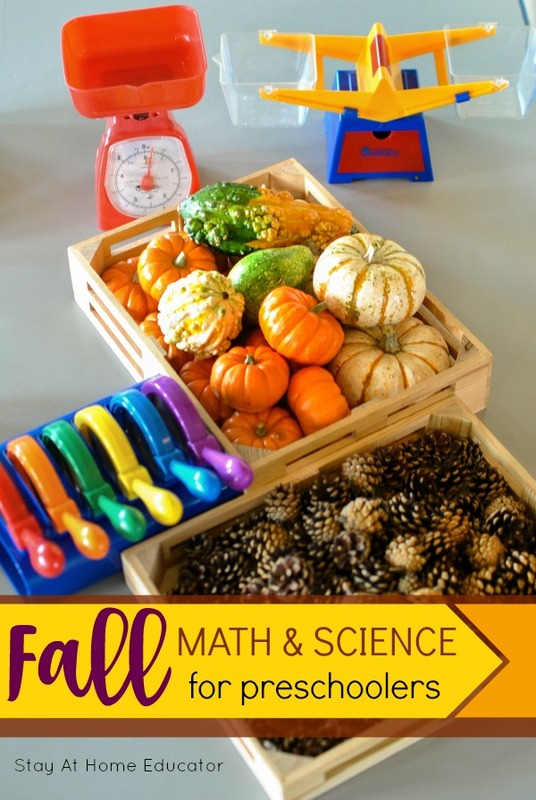 There are so many ways to use them to reinvent your math and science center for a fall theme. 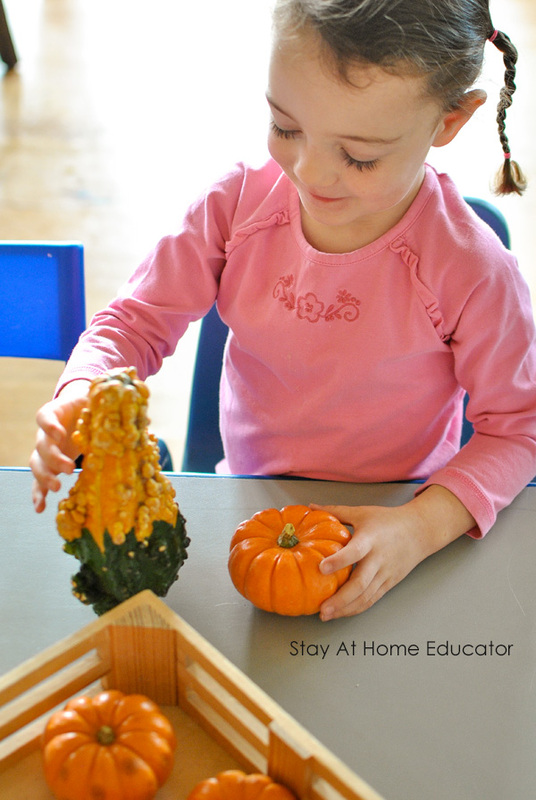 (See this post for one of my most popular fall science centers). 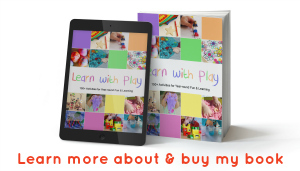 As an early childhood educator, I’m always looking for the simplest ways to bring the best learning into my classroom. In the fall, that means taking advantage of all the foliage and natural elements available. Add some magnifying glasses and some scales, and your math and science center is golden! gourds, mini pumpkins, pine cones , etc. silk leaves (Optional. You can use real ones, but they tend to get crunched up, making a mess). 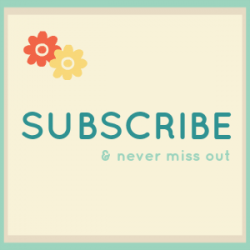 Organize the gourds, pumpkins, pine cones, leaves, etc. into separate trays. I like to use these wooden trays or some wicker baskets . It makes the center feel so much more fall-ish. I think it’s important to spend some time making the center look nice and inviting because it really does make a big difference in getting the children to spend time and explore. Set out some magnifying glasses and some scales. I only had two scales but set out as many as possible, and as many different kinds as possible. (Even digital scales, if you have some). 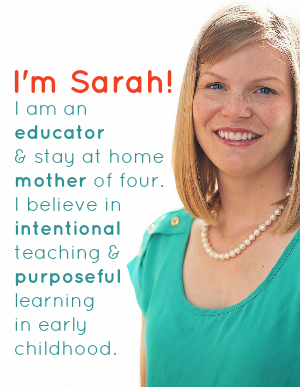 Now, invite your preschoolers to come and explore their new fall math and science center! When it some to open- ended centers like this one, I’m a big fan of sitting back and allowing the children to simply play and explore without distractions from me. I like to let them show my how I need to interact with them to teach them what they need in that moment. 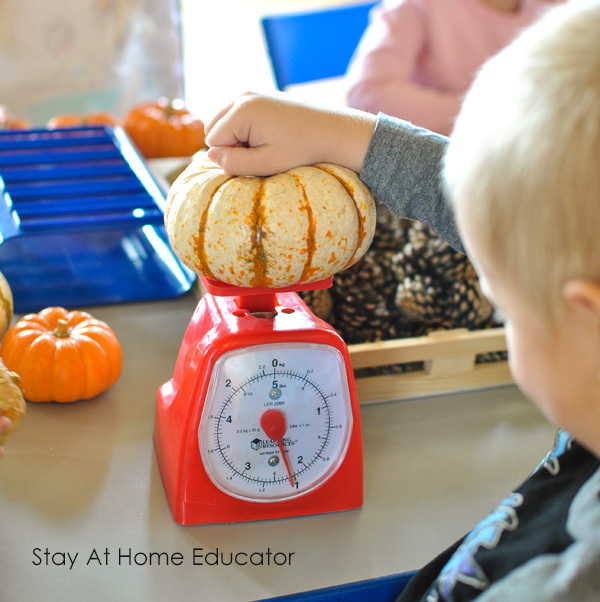 At first, the preschoolers gravitated toward the scales, I think because they were less familiar to them than the magnifying glasses, which we use on nearly a daily basis. It took no time at all for the children to start filling the scales with the fall items. This preschooler had to take the tray off the platform scale because the pumpkin wouldn’t fit. He was problem-solving and using his measurement skills. And then he noticed the needle on the scale moving. At first, he didn’t make the connection. That the heavier the object the higher the number on the scale. He just knew that every time he placed an object on the scale, the needle moved, and when he took the object off, the needle went back to where it began. This is where, as a teacher, I come in. This is guided learning. I sat down next to my student and watched as he placed the white pumpkin back on the scale. Me: What happening to the scale when you put the pumpkin on it? Student: The red stick moves. Me: The red stick is called a needle. Does the needle move every time? Me: How far does it move? Me: That’s just a little past two pounds. See the number two right there? Does the needle move past two with every pumpkin? And the student continued experimenting with the different pumpkins. With the balance scale, the children explored how different object’s weights compared to one another. 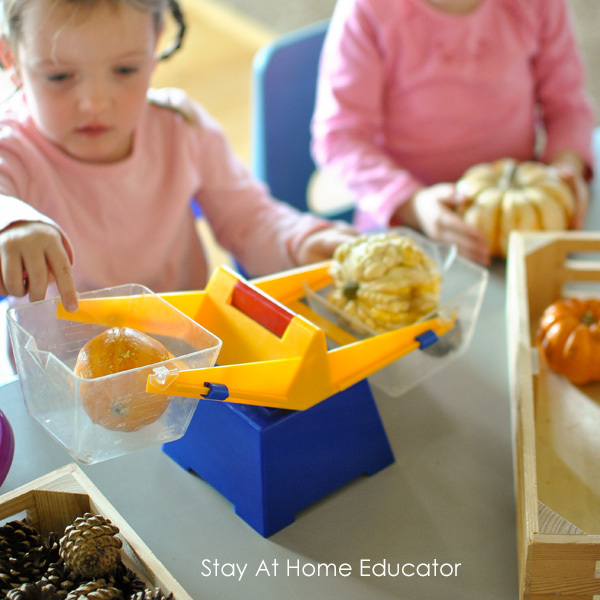 (See this post on how I introduce my preschoolers to using a balance scale). For example, they explored how many pine cones would equal the weight of one mini pumpkin. Or they discovered that five pine cones don’t always equal the same weight as another five pine cones. This brought about an interesting discussion, too. Me: If there are five pine cones in this bin, and five in that bin, will they weigh the same? Me: Have you tested that idea? I then showed the student how to compare the weights, counting out five into one bin and then I invited the student to count five into the other. (I intentionally chose the smallest pine cones to make my point). Me: Uh-oh. The scale is telling us they don’t weigh the same. How does the scale tell us they don’t weigh the same? Me: I see that, too. One side is lower than the other because it is heavier. But they have the same number of pine cones. Why don’t they weigh the same? The student then took the pine cones out and lined them up on the table. With further discussion, the student realized the pines cones varied in sizes, and thus varied in weight, too. We explored this concept again with different mini pumpkins. Other students were content to explore the differences of gourds and pumpkins at our science and math center. She loved feeling the bumpy gourds and tried to make them stand on their own like the pumpkins could. This science center kept my preschoolers busy for days on end. But if yours ever start to get bored, all you have to do is switch out a few items for something else. Pine cones for silk leaves, mini pumpkins for small pie pumpkins, etc. No math and science center is complete without some picture books to support it! Want more autumn math activities? Maybe a little letter identification, too? You might able like this fall bundle!